Paneer tikka fried rice is an one-pot-meal with the goodness of paneer. 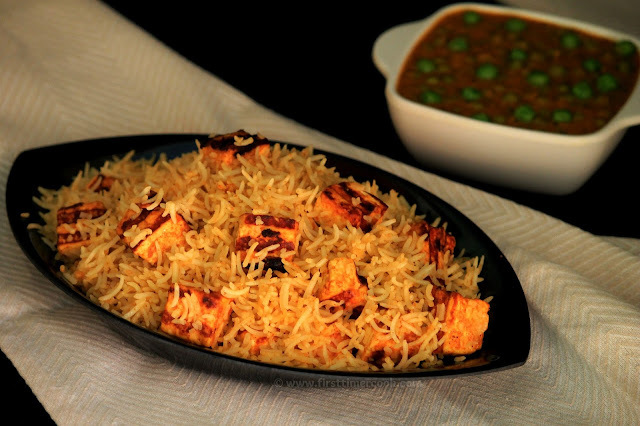 If you have some leftover paneer tikka, then definitely try out this fusion recipe - 'paneer tikka fried rice' recipe which has so much yummilicious fragrant. This one-pot-meal fills your tummy in a jiffy. 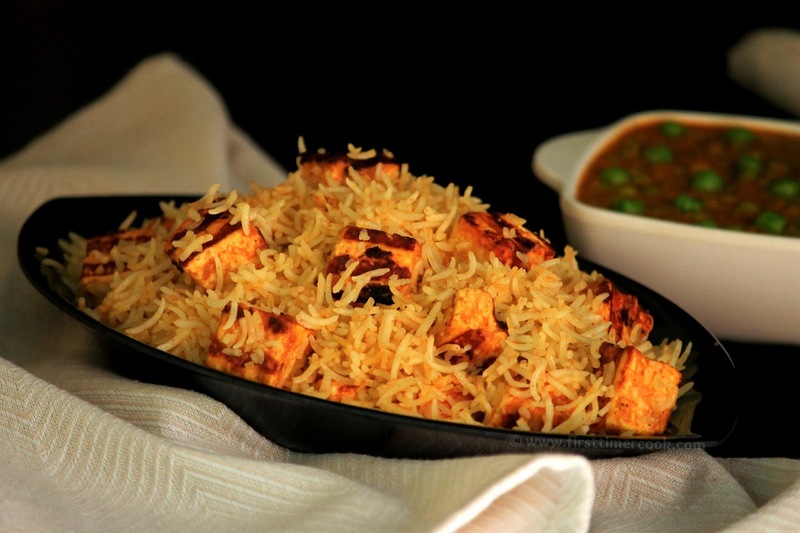 If you are a vegetarian and that too a paneer lover, then you must already be drooling now 😜. This recipe is so simple and easy to make. 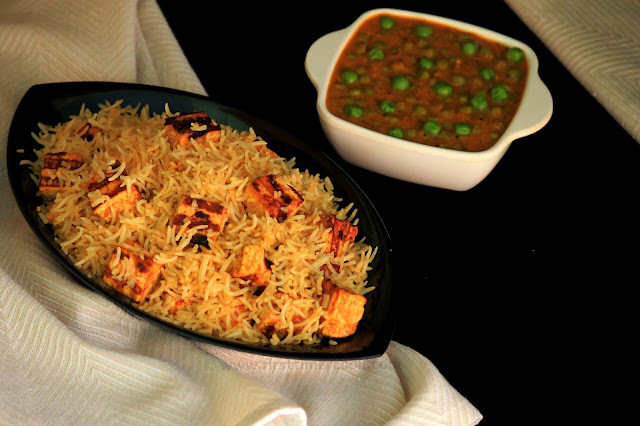 Paneer tikka fried rice gives a nice twist to your everyday meal since this is a delicious combination of cooked rice tossed with grilled paneer cubes. So lets go in details of preparation method. Cut paneer into cubes of 1 inch size and keep aside. Wash the basmati rice and soak in the water for 30 minutes. Take yogurt in a mixing bowl and beat well till smooth. Then add coriander powder, red chili powder, turmeric powder, cumin powder, garam masala, grated ginger, finely chopped green chilies and salt. Mix very well. Now add paneer cubes to this mixture and gently mix so that the paneer cubes are evenly coated with the marination. Cover and keep aside for about 30-45 minutes. Meanwhile heat 1 tbsp oil in a deep pan or wok. Add cumin seeds, cloves, bay leaf and cinnamon stick. Saute on a medium flame for a few seconds. When the cumin seeds crackle, add the soaked rice and saute on a medium flame for 2 minutes. Add 3 cups of hot water along with salt, cover with a lid and cook on a slow flame for 10-15 minutes or till the rice is cooked, while stirring occasionally. Switch off the flame, spread the cooked rice in a plate and allow the grains to cool completely. Now heat a grill pan by applying a little oil. Put the marinated paneer (only put the coated paneer cubes, keep aside rest of the marination) and cook on low-medium flame. Evenly brown all the side by turning the paneer cubes occasionally. Once the paneer cooked completely and evenly browned, switch off the flame. Next heat 1/2 tsp oil in a frying pan. Pour the left over marination and cook by stirring continuously. Then add cooked rice and mix gently, otherwise the rice grain may break. Add in paneer tikka cubes and gently toss to combine well. Cook on a medium flame for 1-2 minutes tossing occasionally. Serve this paneer tikka fried rice hot with any side dish and enjoy ! Instead of plain yogurt, hung curd can be used. In that case just increase the amount of hung curd a bit more, otherwise there will be no left over marination which is supposed to be used with cooked rice.